"We've succeeded in finding and describing a messenger which both quickly and effectively can inform the surrounding cells that something is very wrong and that the cells must therefore band together to fight the foreign micro-organisms," says Professor Søren Riis Paludan from the Department of Biomedicine at Aarhus University, Denmark. He has today published the research results in the journal Nature Microbiology together with Assistant Professor Ramya Nandakumar and a large group of partners from Aarhus, Austria, France, Switzerland and Germany. "The study sheds new light on how the organism quickly and effectively alarms the neighbourhood, and now that we know about the mechanism, it makes sense to continue working on when it might be advantageous to give it a boost to inhibit an infection, and vice versa, when it should be blocked in order to halt an autoimmune disease," says Ramya Nandakumar. On a general level, the findings fall under the scope of Søren Paludan's many years of work on understanding how the immune system recognises infections so that it is able to react with a quick and effective defence. This is a field of research that he has followed and moulded all the way from his postgraduate studies until today—driven by a desire to map how the innate immune system's cells respond to infection. "As I see it, the immune system's recognition of micro-organisms is one of biology's most fundamental issues, and one that we, despite more than a century of research, still don't completely understand," says Søren Paludan. "The fact that our bodies can be constantly exposed to foreign microorganisms in the form of viruses and bacteria is deeply fascinating, as is the fact that in the vast majority of instances it is able to distinguish between foreign and non-foreign. This is critical for our ability to fight microorganisms without our immune system attacking the body's own tissue," adds Søren Paludan. In the study, the researchers cultured cells exposed to the listeria bacteria, which can cause the serious but rare type of food poisoning called Listeriosis. In vitro, the researchers uncovered how the attacking listeria bacteria initially penetrated the cell, where they dumped a little of their DNA. The chunk of DNA was then distributed into the cytoplasm, which surrounds the cell nucleus. Here, the protein cGAS discovered the foreign DNA, and along with the signal protein STING, sent alarm signals into the cell. It is here that the newly discovered messenger comes into the picture in the form of yet another protein, MVB12b, which is responsible for packing and exporting the DNA fragments in fat bubbles called exosomes, which resemble soap bubbles. They are then sent on to the neighbouring cell, where researchers have now documented that defensive responses begin even before the cell is infected—with the protein simply being the unknown distributor. And this is important knowledge in the context of understanding, diagnosing and treating infectious diseases. "This opens for the possibility of being able to 'turn up' the messenger so that it begins fighting the enemy even faster, and can thus suppress the infection," says Søren Paludan. In the study, the research group also experimented with 'turning down' the messenger. This was done in experiments with mice given listeria bacteria while the researchers at the same time studied the effects of blocking the exosome signaling between cells. "When we did this, the mice found it difficult to quickly spread an immune signal and thereby send an alarm signal to the tissue that needed protecting. This provides new perspectives in relation to the treatment of autoimmune diseases such as lupus, which leads to pain in the joints, skin rashes and severe renal impairment," says Søren Paludan. 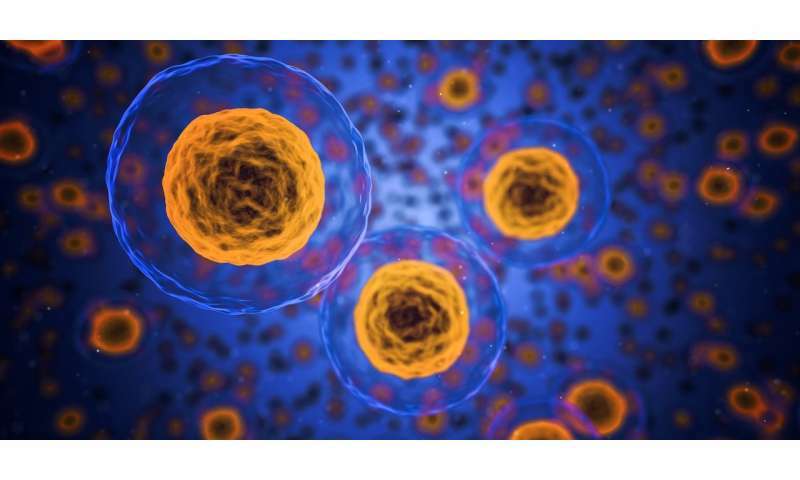 He explains that autoimmune diseases are also characterised by the cell nucleus spitting small DNA fragments out into the cytoplasm, or the cells having difficulty breaking down DNA from dead cells. DNA therefore accumulates in the cytoplasm without any external bacteria or virus coming into play. "Here, the immune system's cells simply start fighting themselves instead of an enemy from outside, and of course, this raises the question of whether it is possible to block the messenger mechanism that we've now found and mapped with these auto-immune diseases. For example, there is considerable interest in the question of whether blocking STING has an effect against autoimmune diseases such as lupus," says Søren Paludan. The body is under constant attack from foreign bacteria and viruses which occasionally penetrate into the body's cells, where specific molecules from the micro-organism such as, e.g., the foreign DNA, are recognised as an indication of an infection. When this happens, the immune system's cells rise to the occasion and fight the infection, whereupon we get better again. When it comes to the autoimmune diseases, the body reacts exactly as above, but its reaction is not triggered by an infection, but by something that is "wrongly interpreted" as being foreign, such as e.g. the cell's own DNA. These long-term immune reactions make us ill, in some cases chronically.